While this revolution is gaining wide acceptance, FuzeX, a project with the aim to revolutionize the way you pay has arrived. FuzeX is a project with the aim to revolutionize the way we pay. They are creating an e-card, where one can store all cards (credit, debit, reward cards) in only one card. They will be also integrating cryptocurrency which can allow you to pay in real stores by using the FuzeX card. They are currently working on a prototype and some videos showing how the FuzeX card might look like as well as how it will work. Please follow the link above to watch the FuzeX video, so as to get a better image of this project. 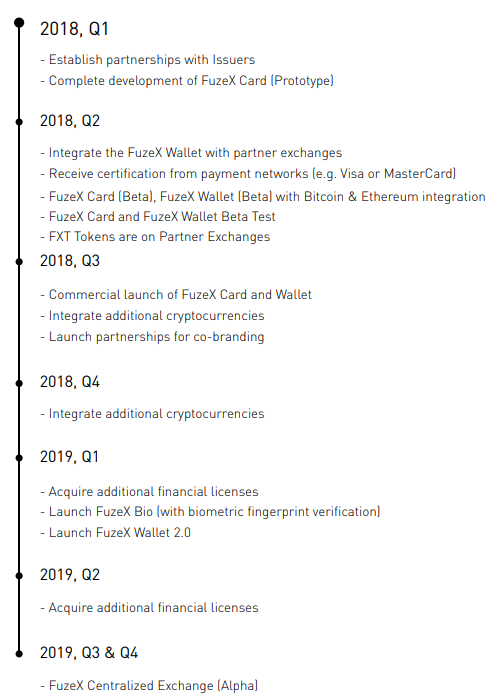 There is a whole ecosystem built by the FuzeX Card, the FuzeX Wallet and the Fuzex Exchange. In the personal ecosystem you can associate to the cardnup to 15 cryptocurrency’s wallets, up to 10 debit/credit cards, and 5 discount/bonus cards. The cryptocurrency, FIAT exchange is done in real time with help from the FuzeX Exchange, so you can use your card anywhere anytime you want. Make spending all forms of currency (fiat, rewards, cryptocurrency), user and merchant friendly. You open your wallet and there they are: BTC, ETH, DASH, NEO, SALT etc. The real-world usability problems associated with cryptocurrencies have encouraged a number of companies to tackle this challenge. This particular challenge is a worthy cause as real-world usability is a major hurdle in establishing cryptocurrency’s legitimacy as a reliable and widely adoptable form of payment. Many of the contenders in this space have approached it with prepaid card solutions. While a logical approach, use cases can be limited to just a couple cryptocurrencies and acceptance by a limited number of merchants, thus, hampering adoption. FuzeX is looking beyond. 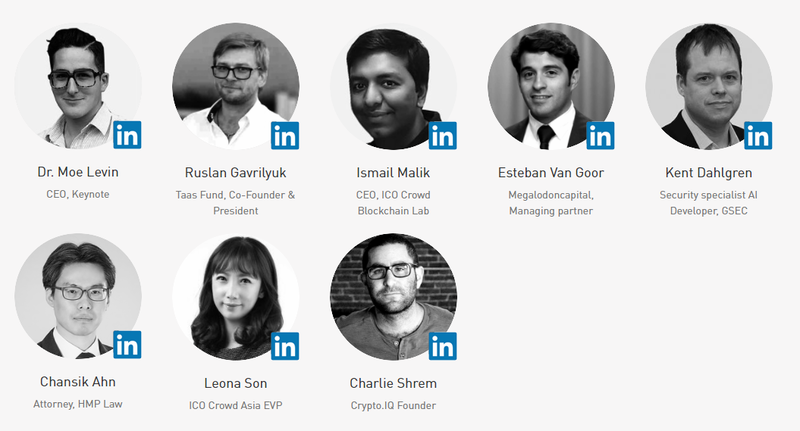 It seeks to deliver an innovative user experience as well as solve the cryptocurrency acceptance problem by introducing the FuzeX Ecosystem. The FuzeX card is identical in size and thickness with a standard credit or debit card with the only difference that it has three input / option buttons. Drawing from experience and expertise in having already successfully developed, brought to market, and sold and shipped (magnetic stripe and barcode enabled) 30,000 FuzeX Cards, the smart e-card that enables users to imbed up to 30 credit, debit, or rewards cards in one, the FuzeX Card will in addition offer multiple cryptocurrencies. Once users have connected their various accounts to the FuzeX Ecosystem through the FuzeX Wallet app, users will be able to use their FuzeX card without having to pull out their smartphones. This is the hub for the FuzeX card and accounts management, this app allows users to store, spend, receive, and transfer tokens with the real-time exchange rate clearly displayed. The FuzeX Exchange is the core mechanism bringing world-wide cryptocurrency to reality. 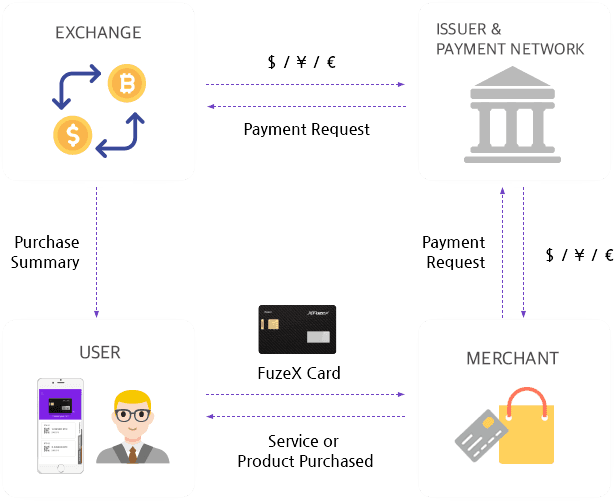 The goal is such that users spend cryptocurrency on their FuzeX card, as they would on a regular card, and merchants receive fiat currency (USD, Euro, Yen, any local currency) as they currently do. In fact, besides, the eye-catching futuristic look of the card, merchants would not know the difference. This is accomplished by accepting the cryptocurrencies FuzeX card users select to use in the FuzeX Exchange, then release the respective fiat currency to the merchant based on the market exchange rate. They adopt their FuzeX card to issuer standards and pay merchants in fiat currency. In doing so, they eliminate unreasonable overhead and resources required for individual cryptocurrencies to establish contracts with individual vendors for cryptocurrency payment acceptance, thus, bridging the gap between cryptocurrency payments and fiat payments. The FuzeX Blockchain enables real time exchange and functions as our backend support for our FuzeX Ecosystem. 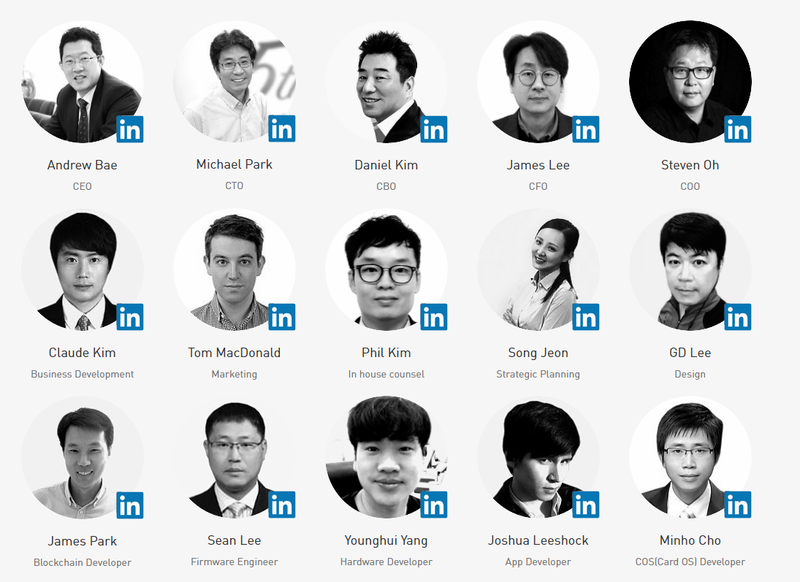 Armed with the technical know-how of engineers, blockchain specialists, programmers along with experienced marketing and business developers, the FuzeX’s team is dedicated to bringing future technology and solutions today. 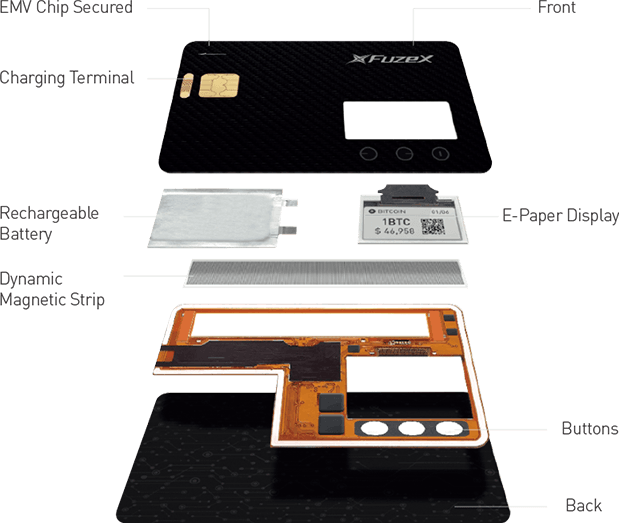 Apart from the usual magnetic strip and chip, this card also includes a small low energy screen, three buttons for some controls and a battery, Safety is the keyword this days and FuzeX didn’t want to stay behind, so they provide some features like two factor authentication both on the card with a PIN as in your mobile with an App password. There is also an option to connect your card directly to your phone thru Bluetooth and the card will only work if this connection is available. As said before you get a small display screen on your card, where you can see your digital resources and balance. FuzeX card will also serve for receiving payments! The E-Parer display screen can also be used to display QR codes for your configurated cryptocurrency wallets. Android and iOS applications will also be available in order to use your smartphone as a complement to the FuzeX card. You can monitor transactions, top up the security levels and will also be available some discounts/bonus to the users. Real-time exchange rates mean that you can spend your cryptocurrency anytime, anywhere you like. Cycle through your cyrptocurrency, debit,credit and reward accounts on the E-Paper display to select your method of payment. Store up to 15 cryptocurrency accounts,10 credit or debit cards and 5 reward cards all in one clever e-card. Two-factor authentication,loss prevention and an on-card key code give you the peace of mind to spend securely.